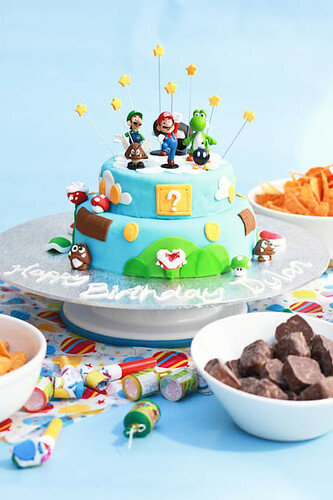 The cake was decorated using fondant, even the characters around the cake were made from fondant. I made Piranha Plants, Goomba's, Mushrooms & Koopa Troopa shells. 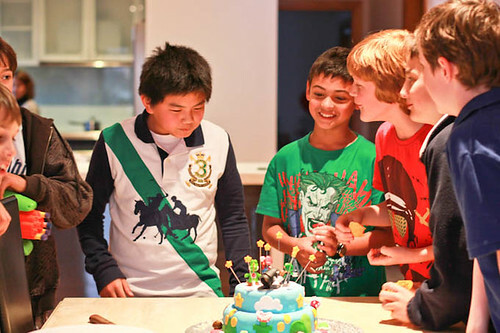 The cake was finished off with figurines, which also make a great present for the birthday boy/girl to keep afterwards. The same cake and frosting recipes that was used to make the Lego cake, were used to make this cake too. I used one quantity of the cake recipe but divided it between a 6" tin & 8" tin to make the two layers. Here is a picture of the inside of the cake. Tip: if you want more height for your cake, just cut each of the two layers in half. Then ice and sandwich each of the 2 layers together (i.e. total of 4 separate pieces, 2 for the 6" cake and 2 for the 8" cake). I added an extra 1 cup of evaporated milk to 1 quantity of the frosting and found that it was enough to cover both layers with a bit extra to spare. PPS: Figurines were purchased from Anime at Abbotsford in a pack for $20. but seriously how long did it take u to make it? 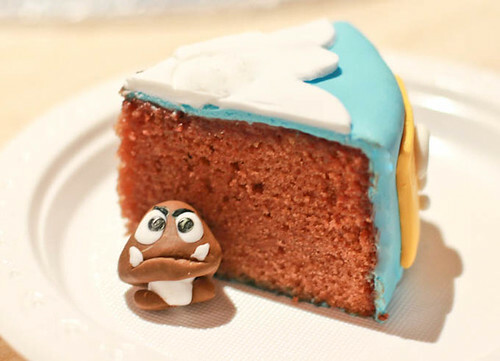 THAT IS THE COOLEST FKING CAKE IN THE WORLD!! IF I DON'T GET ONE COOLER FOR MY BDAY OUR FRIENDSHIP IS OVER RHONDA! ZOMG that is freaking awesome! You should start a proper website that allows people to order cakes from you. Hehe this looks great! I bet your little brother was excited! Freakin awesome cake!! Bummed I didnt get a slice! You've got one lucky brother! Adorable! Complimenting MY cupcakes means a lot from someone so talented as you! Thanks for stopping by. 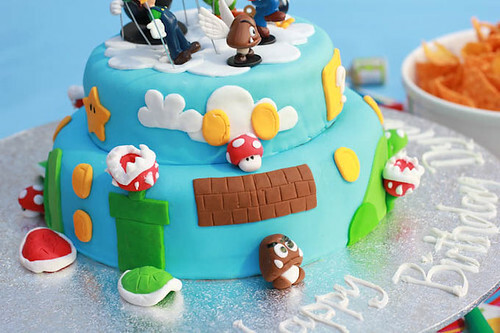 The characters are so adorable, and the fondant-ing on the cake is excellent. You are too clever! Totally Awesome!! I love it and because I love Mario it makes it even sweeter! Wow-You did such an impressive job sculpting those characters. wow!! 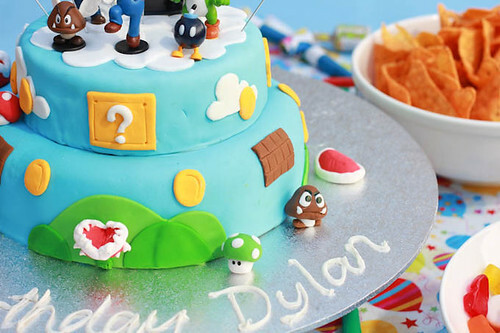 Such an impressive cake and an equally wonderful blog! Kawaii! This is gorgeous. The characters are perfect! 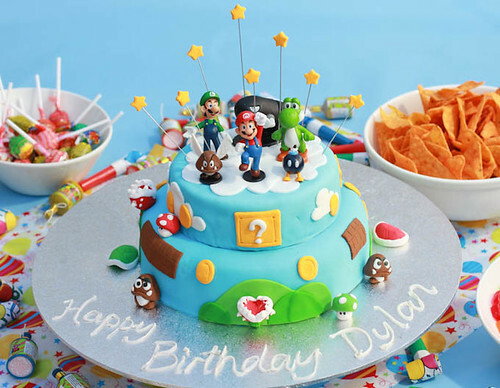 Wow, what a gorgeous and festive cake! You are obviously quite talented. Oh my gosh, you totally nailed this. It's amazing. 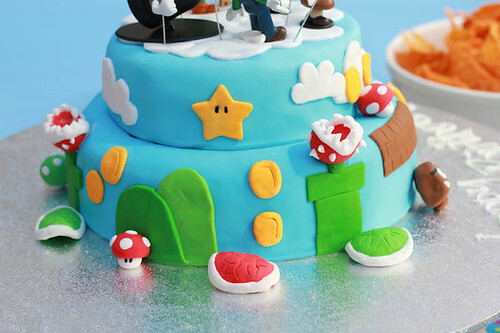 I made the mistake of showing this cake to my little bro and now he EXPECTS one haha fantastic job, so awesome! Wow! Your cake has wowed me!! So creative and fun! Do you sell your cakes? 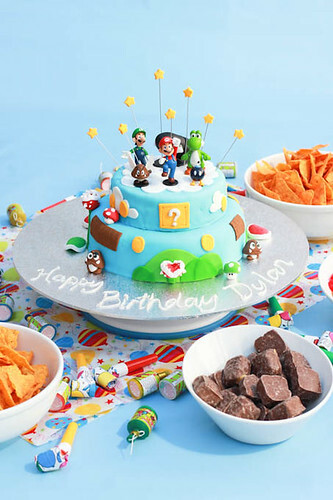 I think my nephew would go crazy for the Mario cake... oh my... I'd better hide this from him. What a wonderful looking cake! I'm in awe of your talent.